Why Drink Beer In A Glass? After a long day, few things are more rewarding than popping the cap off your favorite ice-cold beer. But many beers already come in glass (or aluminum cans, but that’s another day’s discussion) so why bother pouring it into another one? The reasons are more valid than you might think, and after looking more closely at a few we’ll also turn to some of the more popular beer glassware. To Pour Or Not To Pour? People say that pouring beer into a glass gives it a better flavor, but why is that so? The answer actually lies in the aroma produced by pouring. Specifically, pouring your beer activates its carbonation, which manifests as the head of the beer. This head actually consists of millions of tiny bubbles that constantly pop as the beer sits, releasing hop oils and byproducts of fermentation—spices, alcohol, fusels, and more. All the popping releases a steady flow of flavor-augmenting aroma, which you inevitably inhale as you drink. That’s why beer aficionados are so keen for their beer to have the correctly-sized head—too much makes drinking a chore, while too little gives hardly any aroma. Plus it gives your beer that oh-so-classic look. The head that’s created when you pour your beer serves other purposes as well. It’s a way to release some of the carbonation trapped inside the body of the beer, meaning that there’s less carbonation for you to ingest and the beer won’t seem quite as filling in your stomach. Also, the head serves as a buffer between the beer and the atmosphere, inhibiting the oxidation process that turns your beer stale. But Which Glass Do I Choose? The world of beer glassware can be quite overwhelming: not only can the glass vary across beer styles, but even single breweries—especially Belgian ones—have created unique glasses for their brews. To be sure, the right glass can stimulate the senses, but it also controls—you guessed it—the head and how it captures aroma and holds its shape. Despite the multitude of glasses available, you can handle most American favorites with two or three different types of glasses. The pint glass—or tumbler—might be the most versatile of these. Chances are that if you’ve ever ordered a draught beer at a restaurant—and come on, who hasn’t?—you know the one. These come in 16 or 20 ounces and can be “conic” with straight sides, or “nonic,” which adds a bulge for grip and strength. Though some restaurants tend to overuse it, the pint glass is the authentic choice for many lagers, red ales, and amber ales, as well as American IPAs, stouts, and porters. Of course, if your beer has a relatively high alcohol content you may find it arriving in only a 10oz glass, which is a requirement of some states’ liquor laws. If you’re expecting some spirited celebration to accompany your beer drinking, you might just opt for the classic mug instead. In terms of suitable beer styles, it has substantial overlap with the pint glass, but with a few enhancements: it takes the fear of breakage out of making toasts, and it can keep your beer colder for longer than other glasses if you freeze it ahead of time. A third common glass in bars across the US is the Weizen glass, recognizable by its tall, thin sides that bow outward toward the top. These usually come in a hearty half-liter and allow plenty of room for a foamy head. Weizen is German for “wheat” and that’s exactly what goes into this curvy glass, including American dark wheat ales, pale wheat ales, dunkelweizens and hefeweizens. And a fun fact: while the Pilsener glass is sometimes mistaken for the Weizen, the former is generally smaller and has straight sides. Beer is one of our great passions at Noble Hops, as is fresh food served in a relaxing and classy atmosphere. 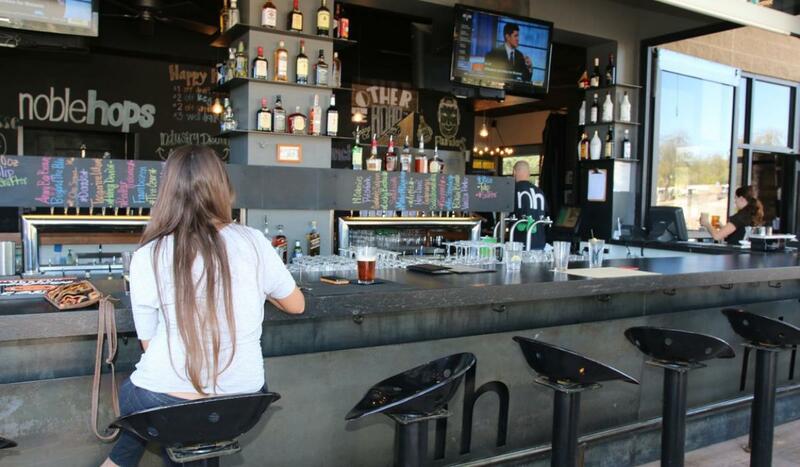 Whether you want to talk beer and glassware or just try a few, be sure to swing by our Oro Valley location from 11am onward for the best gastropub experience in the southwest.